Leveraging on our wide expertise and skills, we are renowned as one of the most profound suppliers of Porous Plastic Filter disc. These arresters are used to stop the spread of an open fire. 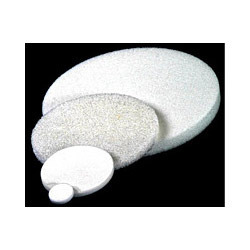 In order to cater the variegated demands of our precious clients, we are offering an excellent quality range of Porous Filter Disc. Our clients can avail our variegated range of products that varies in size and shape. We offer both standard and customized range of packaging according to the clients' needs and requirement. 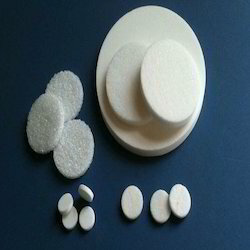 We put forth for our clients Porous Vent Discs, which are used for medical equipment, foaming devices, sealed containers and for automotive batteries as well. These Vent Disc also find application in reagent, fuel sector filters. Some of the other applications of these Vent Disc include blood serum filters and biomedical filters. Filter discs are offered in Porous SS316 / SS316L and Titanium. These filter discs can be used inside our conical filter assemblies, funnel filters, Membrane holder assemblies and even Nutsche filters. They provide particle/fibre free filtration and can be used for several years by proper and regular cleaning.